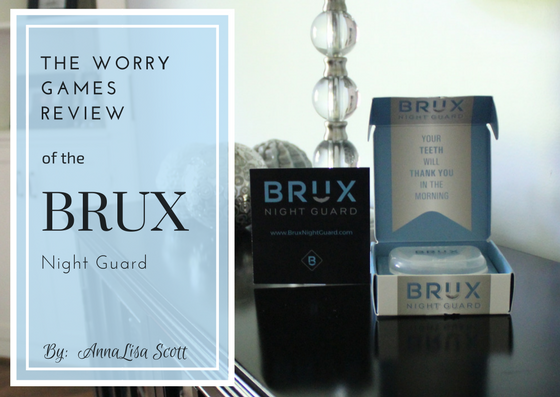 One of the great things about being a blogger is that you often get to sample products for reviews, and I admit that I decided to use that to my advantage a few weeks ago when choosing to do my latest product review on the Brux Night Guard. I have pretty serious TMJ issues and a related ear disorder called Tonic Tensor Tympani Syndrome (TTTS) that are both aggravated by my seemingly impossible to break habit of nighttime jaw and teeth clenching. I also have cracked one of my back molars due to the clenching, and am in the process of scheduling a very expensive but hopefully not too painful procedure to get it fixed so I decided this would be a pretty fabulous time to review a night guard in the hopes of finding one I love, and hopefully saving the rest of my teeth. I have tried a few night guards in the past. One was a twenty-dollar device I purchased at Walgreen’s which simply would not stay on my teeth at night, and the other one was a guard that I paid a lot of money for from my dentist, and it did protect my teeth better than not having a guard at all, but it wasn’t enough to help stop my jaw clenching and the overall pressure that puts on my teeth. 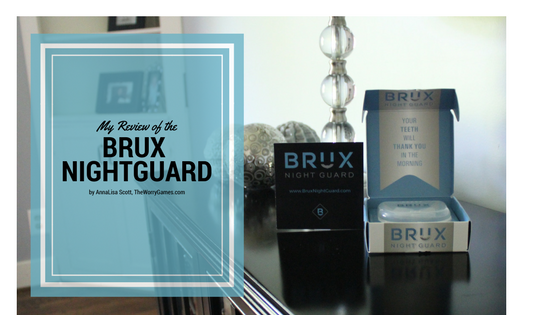 The reason I chose the Brux Night Guard to review over other guards that I found online is because it is smaller, only covering the front teeth, supposedly making it impossible for me to clench my back teeth together. I hadn’t ever tried a night guard of that sort before, so I decided to make the Brux Night Guard the subject of my review. I contacted the company and they were kind enough to send me a sample of their night guard at no charge for this review. Thank you Brux! After about a week the guard arrived. The device is packaged in a lovely blue box which contains a sturdy plastic case, which held the Brux device. If you have read any of my other reviews, you know I am a sucker for good packaging, and I love the packaging of the Brux. Considering it is a mouth guard, I really wasn’t expecting it to be as nice and elegant as it was; I was expecting it to be very “basic”. However it was high quality and dare I say……photogenic? I confess I spent about 20 minutes just taking different shots of it with my new camera for this review. The Brux is smaller than I had thought it would be, approximately only a few inches wide. Because I had read that it did not fit over the back teeth, I was expecting it to be small, however I was still expecting something a bit larger and I remember wondering how well the device could work at that size. It’s attractive enough for a mouth guard, consisting of a white plastic U-shaped “shell” with blue molding substance inside. It comes with a vented plastic case to place the device in when not being used. This night guard should be, at the minimum, rinsed every morning and several times a week should be cleaned with hydrogen peroxide or denture cleaning tablets. Specific details pertaining to the care and cleaning of the device are found on the product’s website. According to the product website, this night guard is not intended for those with braces or dentures and it is made in the USA. The Brux works by boiling the device in water for a few minutes, then taking it out of the water and quickly running it under cool water for a few seconds. 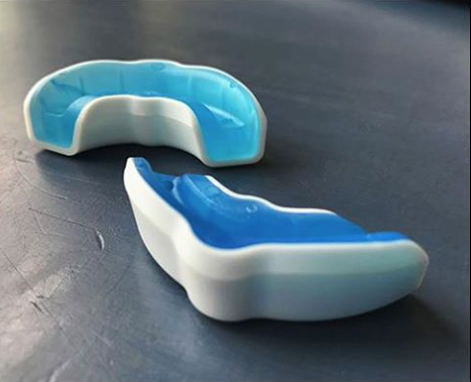 The next step is to line the tray over your top or bottom teeth and bite firmly down into the blue molding gel for 60 seconds, leaving your imprint which gives the tray a custom fit, making it uniquely “yours”. This was a very easy process until I got to the “bite firmly down” part. I had a root canal on my front tooth a few years ago and it has always made me a little nervous to bite down too hard on anything with my front teeth. I think this affected my results the first time I tried to fit the mold to my teeth because after following the directions, I couldn’t get the guard to stay snugly on my teeth – it kept coming off. Fortunately the mold allows for “do-overs” and I was able to start the whole process over from the beginning, this time taking a bit longer to gently but firmly push my teeth into the mold. After doing so, I was able to feel a bit of a “snap” when putting the tray into place in my mouth, and this time I felt confident that I had a good fit. The Brux guard felt very odd in my mouth as I knew it would. I felt a bit like a football player or a boxer, but I noticed right away that my top and bottom back teeth could not touch together. There was nothing but space between them and that excited me. Even though it was uncomfortable, I knew that I was going to give it everything I had to try to get used to it because I was so happy about the idea of my teeth not being able to make contact while I slept. Trying to sleep the first night was a bit rough. I kept wanting to take it out so that my jaw and mouth could go into their “natural” resting position so I would feel “comfortable” again. But every time I got the urge to do so, I reminded myself that my natural “comfortable” resting position always led to a clenched jaw which was cracking my teeth and could potentially cost me a bundle down the line. That was a pretty good incentive to leave the guard in. I finally fell asleep, and once I did, I didn’t have any problems with the guard waking me up due to discomfort. After a week of using the Brux Night Guard, I wouldn’t say I am 100% used to wearing it to sleep, but it is getting easier every night. The last few nights, I have quickly become absorbed into the show I was watching while lying in bed, and I really didn’t think much about the guard after a minute or two so I am taking that as a good sign that I am adapting to it and pretty soon it will be “old hat”. In the mornings upon waking after wearing this night guard all night, my front top teeth feel a bit sore underneath the guard..a bit like what it felt like when you started wearing your retainer as a kid…but nothing serious. My back teeth feel great though. I feel…..nothing – and that is a good thing for me. Normally I immediately notice a bit of soreness in my back teeth upon awakening to indicate that I have been applying pressure to them all night. But because I now can’t bring my teeth together at night, I do not feel that soreness anymore. It’s a good feeling, and one that I especially noticed the first morning after wearing this device, because I am so not used to waking up without that discomfort. My jaw line on my “bad TMJ side” still feels a bit sore, but less fatigued, if that makes sense. The soreness may be due to my chronic joint issues or perhaps because I am still trying to clench my jaw and teeth while I sleep even though I can’t bring the teeth together. I believe the Brux guard has helped my other TMJ/TTTS symptoms somewhat but it is hard to say for sure because I have such severe TMJ that even if this guard did take some of the strain off my jaw, I don’t think a week would be long enough to heal up any previous strain or stress related symptoms or issues I had going on. However since I began using this guard, I will say that I have been able to talk longer throughout the day without having pain flare ups, and my overall level of facial pain, fullness in my jaw, and inner ear symptoms seem to be lessened. Normally I can only say 4-5 sentences before my TMJ pain kicks in, and for the past week I haven’t really noticed any issues with jaw fatigue at all after speaking. It makes me think this guard must be doing something to take at least a little strain off of my jaw at night, even if it can’t completely prevent me from tightening up in that area. My TMJ and TTTS are a huge mystery to me as far as what causes them, so I honestly don’t know, but that is just an observation I noticed. As far as teeth grinding, since this is not something that I engage in, I couldn’t say with 100% certainty whether or not it helps with that, however since my top and bottom teeth are unable to touch, I would think it would be nearly impossible to do any grinding of teeth while sleeping. If I didn’t know how much mouth guards from the dentist office were, I would have thought this was a little high. However, since I do know – and it is a lot of money – I am thinking the price of the Brux really isn’t that bad. It runs $70.00 and it seems to be a well made teeth guard that is of better quality than the guards I have used from the drugstores in the past, and a better design than the one I received from my dentist, so I am okay with the price. I think this mouth guard does the trick. I have noticed a bit of an improvement in both my TMJ and TTTS symptoms after only wearing it for a week, and my back teeth felt better from the very next morning after first wearing it. Even if it proves to not be a “miracle cure” that completely takes away my jaw and ear issues, I have no doubt that continuing to use this device long-term will help protect my back teeth from further clenching related cracking or breaking. This is definitely something I will continue to use while sleeping – and while writing, I have decided, because as I was typing this paragraph I just realized I was clenching my teeth together. (I have to start meditating more.) I think wearing this device any time I have a tendency to clench will go a long way toward saving me trouble both in the short and long-term. 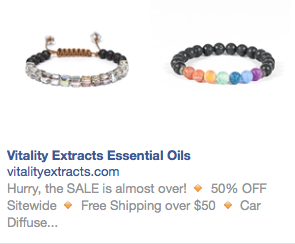 I am giving this product a good recommendation. If you do try it yourself, please let me know what your experience was like, and I will pass it along to my readers. 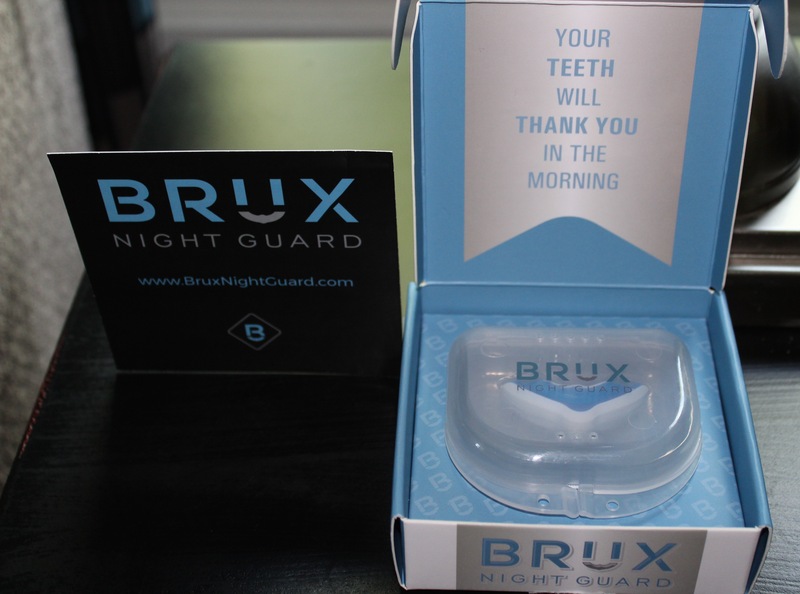 The Brux Night Guard can be purchased from their website at BruxNightGuard.com. Photo Credit: All photos property of TheWorryGames.com unless otherwise specified. I like the Brux. And I need to use this product. However, it looks funny and I am embarrassed to wear it at night when my boyfriend stays over. Any thoughts? Hello!! Your post/review pg this night guard were very informative, well written, and entertaining…yes you made talking about a night guard entertaining!! A mouth guard from my dentists office is going to run me close to $300.00!!! So I think this product might be a good fit for me!! That is great Reba, let me know what you think!